22 • March 2018 • S I G N & D I G I T A L G R A P H I C S ELECTRIC SIGNAGE A new venture for Gerhart is selling custom neon signs, such as this OPEN sign, through Etsy. com. Essential neon shop equipment… Moved On, but Not Out It was inevitable that SBI would even- tually close its neon shop, so when the time came, Gerhart put his own shop together with equipment pieced together from a couple of sign shops that had also closed their neon departments. He started an independent shop and quickly confirmed neon is still in demand: "When I left SBI, all the sign companies got the word out and they were calling me, wanting to know when am I going to be up and running. So I was busy from the get-go," he says. And he's been busy all along and ever since and the work he does is as varied as neon lights can be. An upside to the diminished neon industry is that there are fewer people around who still know how to "make neon," so the skills he's been refining are still in high demand. A lot of the bread- and-butter work comes to him through sign companies that need neon made for new open channel letters and similar exposed neon projects, or they need an existing sign repaired. Most people don't realize neon is hand made, thinking it's machine-made in a factory somewhere. And being hand- made, every piece, no matter how metic- ulously a person follows the pattern, has a uniqueness to it that only comes from being hand made. This uniqueness is valuable to many discriminating clients who want that hand-made quality in a product. 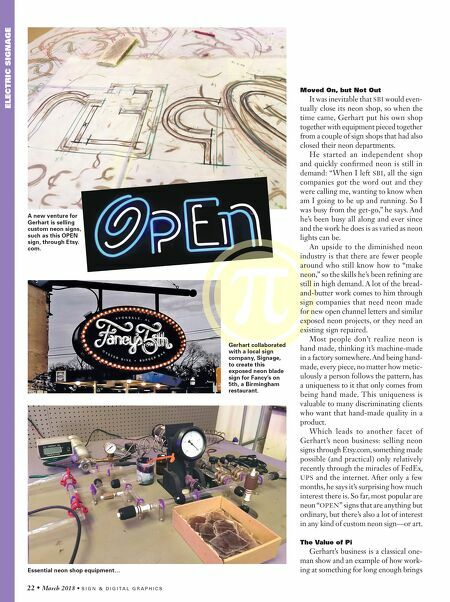 Which leads to another facet of Gerhart's neon business: selling neon signs through Etsy.com, something made possible (and practical) only relatively recently through the miracles of FedEx, UPS and the internet. After only a few months, he says it's surprising how much interest there is. So far, most popular are neon "OPEN" signs that are anything but ordinary, but there's also a lot of interest in any kind of custom neon sign—or art. The Value of Pi Gerhart's business is a classical one- man show and an example of how work- ing at something for long enough brings Gerhart collaborated with a local sign company, Signage, to create this exposed neon blade sign for Fancy's on 5th, a Birmingham restaurant.